Who is it for? 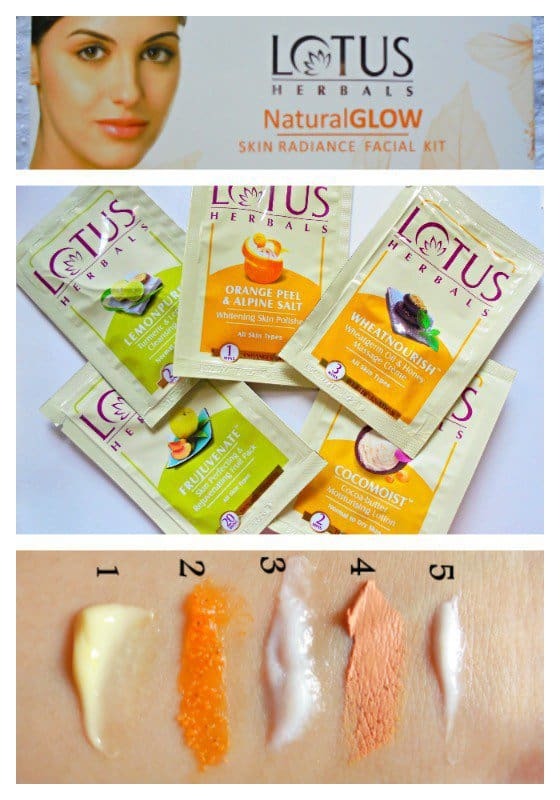 Lotus Herbals NaturalGlow Skin Radiance Facial Kit is a complete kit that contains 5 step facial products. This kit is best for combination to dry skin types. The scrub is for heavy exfoliation so this kit is not suitable for sensitive skin. This facial kit contains 4 single-use kit boxes in a big box. Though I bought the big box, the single session boxes are also available. In each box, there are 5 sachets containing cleansing milk, scrub, massage cream, face pack, and moisturizer. The packaging is very hygienic and travel-friendly. The step 1 product, Lemonpure cleansing milk if off-white in color and its texture is lotion like and creamy. It is able to get rid of both water-soluble and water-proof makeup. The step 2 product is an Alpine scrub. It is a salt based exfoliator of light orange color. Its texture is gritty. The next step product is Wheatnourish. It is a thick textured heavy massage cream. It has a white color. The 4th step, Frejuvenate is a fruit-based clay face pack. This pack looks muddy yellow and has a thick texture. The final product is a Cocoamoist moisturizer. It is a thick and creamy lotion moisturizer targeted to dry skin. The Lemonpure cleansing milk has an energizing citrus fragrance. The fragrance makes me feel fresh. The Scrub has minimal fragrance. It smells of oranges. The Wheatnourish massage cream has very soothing floral and incense kind of fragrance. This is my favorite smelling product from the whole kit. The Frejuvenate pack has mud like fragrance with a hint of apple in it. This is my least favorite fragrance. The Cocoamoist moisturizer has soothing rosy fragrance. It is another one of my favorites in terms of smell. I have tried a number of facial kits and I can surely say, this is the best of them all. Each product of this kit is effective in terms of performance. If they suit your skin then you will certainly get a long-lasting result. This is the only facial kit that could take care of my stubborn blackheads with minimal use of blackhead removing tool. This kit provides dullness free skin from the single-use and makes the skin glow in health. What do I like about this facial kit? What I dislike about this facial kit? Out of all home facial kits, this one is my all time favorite. I have already bought it a few times and will keep buying. I would recommend it to everyone having combination, dry or extra dry skin. Nature’s Gold Facial Kit – Is it Worth Buying ? Aroma Magic Facial Kit Pearl – Best Facial Kit For Oily Skin in Summer ? Biotique Facial Kit Party Glow: Best Facial Kit?